This slow cooker recipe takes minutes to prepare and makes a delicious pot of green, shredded pork. It’s awesome in taco shells, tortillas, salads, quesadillas, enchiladas, Mexican pizza, etc. Freeze leftovers for later enjoyment! Slice onion and place it in bottom of crock pot. Trim excess fat from pork and place it atop the onion. Sprinkle with cumin, salt, and pepper. Pour the full jar of salsa over the meat. Cook in crock pot for 8 to 10 hours on low, or 4 to 5 hours on high. About 30 minutes before eating time, shred the pork. Make sure it's all submerged in the sauce and keep on warm setting until meal time. 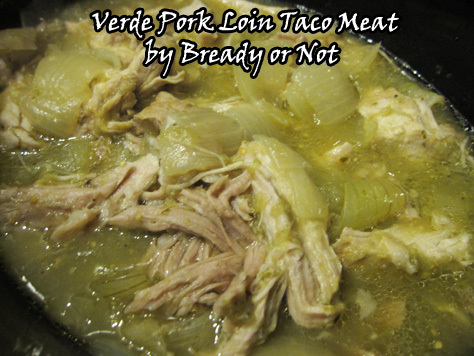 This verde pork is awesome in taco shells, tortillas, salads, quesadillas, enchiladas, Mexican pizza, etc. It makes for happy leftovers, too.